As the risks to the global economy mount amid strong growth in the United States, investors should ignore splashy headlines that do not impact market and economic conditions. Global stock markets remained volatile in the second quarter despite solid corporate profits, as investors began to focus on slower growth in many parts of the world. Last year, most of the world’s economies were expanding. Japan, Europe, and many emerging markets led the way as global GDP growth accelerated. As we transition into the second half of 2018, global economic growth is decelerating. Many economists are lowering their global growth expectations after a quarter that saw labor strikes in France, political turmoil in Italy and softer economic data reported in Germany and China. While risks to the global economy mount, U.S. economic growth remains solid. The unemployment rate in the U.S. stands at a 48-year low at 3.75 percent. There are more job vacancies than unemployed workers, according to the Bureau of Labor Statistics’ Job Openings and Labor Turnover Survey. GDP growth in the United States, which lagged global growth last year, is expected to surpass 4 percent in the second quarter, outpacing expected global growth of 3.1 percent and well above most economists’ earlier estimates of below 3 percent. Despite the solid economic data, many investors are worried about future economic conditions, even in the U.S. This anxiety is exacerbated by a daily stream of alarming news headlines, which may be one of the factors causing the increase in stock market volatility. While some articles contain news items that could impact market and economic conditions, others are just “noise” that causes fear and anxiety. For example, political arguments and scandals have little to do with growth in the economy or corporate earnings. Even news that could impact economic conditions, such as news about tariffs or rate hikes, is often incomplete and involves too much conjecture for anything conclusive in terms of economic impact. The Federal Reserve might raise rates too aggressively. A trade war might break out if the U.S. and other countries follow-through on their tariff threats. For investors, it is important to ignore the rhetoric and focus on the factual, not the hypothetical scenarios envisioned by competing partisan factions. It is also important to keep in mind that over longer time periods corporate earnings growth and the level of interest rates determine the market’s direction. Currently in the United States corporate profit growth is strong, inflation is still under control, interest rates remain low, and jobs are being created. There are two issues that have the potential to derail the economy in the U.S. Both are preventable. First, strong economic growth and rising input costs are sparking speculation that the Federal Reserve will hike rates more aggressively to head off inflation. If the Federal Reserve hikes rates too aggressively it could slow growth. Second, if U.S. foreign trade policy creates a global trade war, global growth will suffer. At this point, gloomy projections are just hypothetical. But with stock market valuations at the high end of historical averages, such conjecture is likely to contribute to the continuation of elevated global stock market volatility. 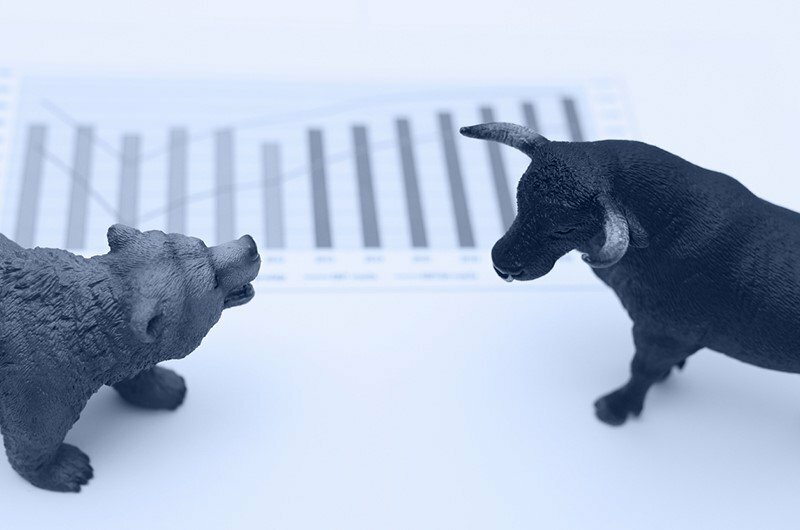 Longer term, solid economic conditions could boost stocks prices, but with valuations elevated following a nine-year bull market, future returns may be less than their historical averages. Equities in many foreign countries are less expensive than their U.S. counterparts, but returns will likely be below their historic averages as well. The solution to both rhetorical and real threats to the economy is a long-term asset allocation that suits your risk tolerance. With a portfolio based on an understanding of the nature of the markets and including risk-reducing assets such as bonds and alternative investments, the probability of reaching your long-term investment objectives won’t be impaired, despite a volatile market. The information included in this document is for general, educational and informational purposes only. It does not contain any investment advice and does not address any individual facts and circumstances. As such, it cannot be relied on as providing any investment advice. If you would like investment advice regarding your specific facts and circumstances, please contact a qualified financial advisor.